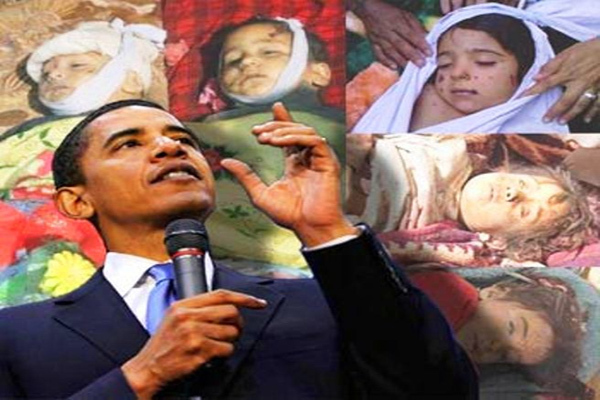 Pakalert Press » Obama – How Many Kids Did You Kill Today? Obama – How Many Kids Did You Kill Today? In the 1960s, Lyndon Johnson was heckled this way. Anti-war activists targeted his Southeast Asian war they wanted ended. Obama way outdid his predecessors. With two years left to go. Bombing 7 countries in 6 years. More on this below. Plus subversion in unknown numbers of others. From its empire of bases. Its global embassies infested with CIA agents. FBI ones operating abroad. Diplomats serving its imperial interests. Drone bombers able to hit targets anywhere. Kill on demand. Perhaps Obama has new targets in mind. Angering China. Recklessly challenging Russia. Risking the unthinkable. Governing more repressively than any previous administration. Continuing where George Bush left off. Adding his own extremist policies. Making America more than ever unfit to live in. What’ll it look like when he steps down in January 2017? What shambles will he leave behind? What chance will be left for world peace? What futures will young people have? What about millions worldwide wondering if America plans targeting them next? What about too many corpses to count attesting to his barbarity? Dominating NATO policy. Unleashing its killing machine ruthlessly. Advancing its imperial objectives. Partnering in Israeli wars. Largely against defenseless civilians. Most often Palestinians. Murdering them in cold blood. Longstanding US policy in all its war theaters. What about Obama’s Big Lies about wanting peace? The most unworthy Nobel Peace Prize recipient ever? Making the world more than ever unsafe to live in. What about stopping him before he slaughters everyone? What kind of society puts people like him in charge? Together with likeminded extremists. Playing Russian roulette with planet earth. Perhaps inventing new ways to destroy it. Life in all its forms. Except bacteria and maybe a few resilient ones. When not bombing, he sanctions. Targeting Russia, Iran. North Korea. America’s favorite punching bag. Inventing reasons to hit harder. Accomplishing nothing besides burnishing his bullying credentials. New sanctions targeting Pyongyang’s Reconnaissance General Bureau (its main intelligence operation). The Korean Mining Development Corporation (KOMID). An arms dealer/exporter. The Korea Tangun Trading Corporation. Supporting Pyongyang’s defense and development programs. Blaming North Korea irresponsibly for hacking Sony Pictures. Something it had nothing to do with. No evidence suggests it. Innocence is no defense. Guilt by accusation suffices. America’s global crimes go unmentioned. Obama acted by executive order. Unilateral diktat power. Wielded lawlessly. Claiming constitutional authority. None whatever exists. Who will he target next? What justifying reasons will be invented? How much more abuse can people take? Look at his warrior record since day one in office. Bombing his way perhaps into the Guinness World Records. With two years to go to set a high bar for anyone to surpass. With over one a year on average, maybe he’ll bomb 9 or more before his tenure ends. A post-WW II record. Unheard of by a so-called democracy. One in name only. A country with no enemies. Except ones it invents. To wage more wars. Preemptive ones. Permanent ones. Aggressive ones. Without just cause. Making the world safe for monied interests. Advancing its imperial ambitions. Threatening planet earth. Humanity’s survival. Syria is Obama’s newest target. So is Iraq. For the third time since January 1991. US involvement has nothing to do with official reasons. Everything to do with protecting Big Oil’s interests in Iraq. Balkanizing the country into the Baghdad center. Kurdish north. Basra south. Ousting Syria’s Assad. Replacing him with another convenient US stooge. Eliminating an Israeli rival. Isolating Iran. Washington’s next regional target. Wanting unchallenged Middle East control. Making it safe for US monied interests. Benefitting their bottom line priorities. Millions of corpses a small price to pay. So is unspeakable human misery. America uses ISIS/ISIL/IS (the Islamic State) as a pretext. Previous articles explained it’s a US ally. Armed, funded, trained and directed. Used as shock troops against governments America targets. Against Syria for nearly four years. The way Obama uses Kiev fascists against their own people and Russia. Voltaire Net’s Thierry Meyssan discussed Washington’s “incredible” Syrian “peace plan.” Balkanization. In two parts. There’s more, says Meyssan. Assad gets to stay. he believes. Syrians reelected him overwhelmingly. His “private consultants” have to go. Constitutional reform made him “responsible to the nation.” Syria’s survival depends on excluding its “territorial integrity” as a “prerequisite” for any proposed peace talks. Typical Washington strategy. Machiavellian and then some. Obama continues bombing Syria without government approval. More war crimes on his rap sheet. Killing civilians. Destroying infrastructure. Intending war taking years to resolve, according to Pentagon officials. Look at his “military engagements” throughout his tenure, said RT. Constant war. In multiple theaters. Direct and proxy. Not a single day of peace. None planned ahead. America’s Afghanistan war may continue for another decade. Maybe two. US forces came to stay. Supplemented by private military contractors. Permanent occupation is planned. Stooge governance takes orders from Washington. Human misery is beyond description. Imperial priorities alone matter. Yemen is part of Washington’s war on terror. At stake is its strategic location. On Saudi Arabia’s southern border. Near the Horn of Africa. The Gulf of Aden connection to the Indian Ocean. The Red Sea. Its Bab el-Mandeb strait. A key chokepoint. Separating Yemen from Erttrea. Through which millions of barrels of oil pass daily. Washington wants its own convenient stooges in charge. Conflict is longstanding. With no end in sight. US bombing almost exclusively by drones. Mostly killing noncombatants. Targeting Pakistan the same way. Begun under Bush. Intensified under Obama. Hundreds of attacks since he took office. Killing thousands. The vast majority civilians. In the wrong place at the wrong time. Signed: Shireen Mazarisaid, PTI information secretary. Somalia is another longstanding US proxy war. Against Al Shabaab freedom fighters. Bush officials declare the group a “specially designated global terrorist entity.” Despite operating solely within Somalia. Washington wants unchallenged control of a strategically located state. On Africa’s Horn. Waging war for years to achieve it. With no end in sight. Saying he “supported the birth of a new democracy.” America’s deadliest export. Destroying North Africa’s most developed country. Most Libyans supported Gaddafi. For good reason. For using Libya’s oil wealth responsibly. Providing vital social services Americans can’t imagine. Pre-2011 Libya no longer exists. Dystopian wasteland harshness replaced it. US-led NATO murdered tens of thousands. Displaced many more. Today’s Libya is a charnel house catastrophe. Its sovereignty destroyed. Replaced by instability, insecurity, and daily violence. One of many genocidal war crimes on Obama’s rap sheet. Accountability nowhere in sight. More wars ahead planned. America’s insatiable appetite needs feeding. Making the world safe for war profiteers. Carving up whole continents to enrich them. Stealing their land, labor and resources. Turning planet earth into a US colony. Perhaps destroying it altogether in the process. Stop NATO reported on US squadrons training for air war in Europe. Is the entire continent Obama’s next target? Is America Preparing for War with Russia in 2015?